Spiritual Teacher Sri Chinmoy composed and performed thousands upon thousands of devotional and meditative songs during his life. He wrote several books on the subject of music as well. There are seven higher worlds and seven lower worlds. Each world has a music of its own and a note of its own. The higher worlds have a music that awakens us, inspires us, illumines us, perfects and fulfils us. The music of the higher worlds constantly comes to us as the harbinger of the highest Height, whereas the music of the lower worlds naturally comes to us as a messenger of destruction. It is not only the higher and lower worlds that have a music of their own; each individual has his music, each movement has music, each action has music. Each time we breathe in and breathe out there is music. When we don’t pay attention to the inner depth of the action, we don’t hear the music. If we do pay adequate attention to each action, then inside the very depth of that action we are bound to hear music. Unless we hear music inside each action, the action is lifeless. Sri Chinmoy’s vast musical output (over 13,000 songs in his native tongue Bengali alone) seemed to tap into exactly what he describes in this quote about the all-pervading and infinite kinds of music accessible to the spiritually initiated. For just a small taste of his unbounded creative expression, listen to Nirab Amare performed by Kusahli Tarantsova and Rageshri Muzychenko, the musical duo Silence and Sound, a violinist and keyboard player from the Ukraine who are both students of Sri Chinmoy. Recently I found comfort, insight and solace in contemplation of Psalm 139. As I prayed and meditated on this well-known Psalm from the Bible, its message fostered a feeling of increased intimacy with God and trust in God’s unconditional love. 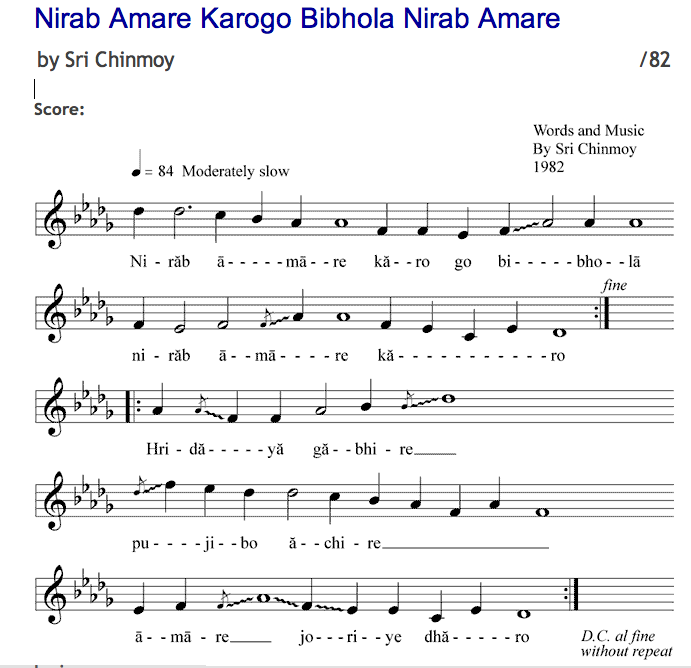 The Bengali lyrics of Nirab Amare translated into English resonated with this teaching found in Psalm 139 with its culmination in a close embrace by the Supreme. O Self-transcendent and Self-amorous One. Very nice Sharani, the MP3 is very good quality its good to have the music as well. The media plugin is the Anarchy Media Player. Instead of having to FTP an audio file to the WordPress host, I could just add it from the upload function at the bottom of post creation and it automatically creates the player when you send it to the browser. Now that’s my kind of simple! What a lovely piece of music – one of our Guru’s many beautiful classics. It has lifted me – and I needed that today! I will try to learn it on my flute. Nice article Sharani – thanks. Do let me know if you record yourself playing the song and add it to your blog. I really enjoy listening to your flute pieces on your site. I like to write you, it is like finding a place to be happy. What a delight to see you have blog posts at Priyadarshan’s site. I look forward to a new place to visit on the Web and when you include some in German it can help me see how much I remember from studying German language in school.